Wolf Sirens offers readers an answer to the Twilight saga, but with a strong female lead. The female protagonist, Lila Crain is just an ordinary girl with dreams, which dull even her, until she meets the angelic-faced teenagers that invite her into their clique. Shocked to discover they are wolves as one attacks her, she is saved by the mysteriously scarred Cresida James. Enamoured with the pack, suddenly, deeply, driven by forbidden desire Lila longs to be part of their eternal world. Suspense builds as she learns their secret, but then she must come to terms with the fact that she is the one thing that threatens their existence. Chosen by the spirit of Artemis, what she is, and who she is, are two different people. Somewhere inside her the love and desire she feels dooms her to make choices, which will either go against her kind or destroy the creatures she loves. Lila prepares to take her best friend’s place as the next Huntress of Shade. Inspired by the legends of the Greek demigod Artemis and the mythical femme fatale, Wolf Sirens is an intimate tale of unrequited and forbidden love in the underworld, a masterpiece of romance fantasy. If you want a book with mythology, mystery, heartache, romance and wolves, then check out this paranormal series. Paranormal is like fantasy but it is set in reality. I connected with the genre, fascinated by the juxtaposition of myth and stark reality combined. Paranormal at its best is like a metaphor for life. Spend time on it, develop something great and then make it greater. Follow your heart and write for yourself. I love that saying write like no one will read it and edit as though the whole world will. Tina Smith is an herbalist, dog lover, Piscean and mother. She lives in Adelaide Australia and works at Mega Health as a Wellness Consultant. She is a part time student of Naturopathy. 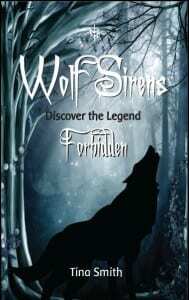 A love of the fantasy genre and the deep exploration of dark and evocative subjects inspired Wolf Sirens Forbidden. The sequel Fever further unfolds the tale of the heroine femme fatale, on her journey in the underworld between the lands of myth and reality. Tina learnt to shoot for Wolf Sirens. She enjoys yoga, soaping, reading and is obsessed with writing. Night Fall, her third novel, will be released in June 2013.